Yarumal was founded in 1787 as San Luis de Gongora. Municipal status was granted in 1821. The current name of Yarumal comes from a local plant belonging to the Moraceae family, known in botanical Latin as Cecropia peltata L.
An unusually large proportion of the inhabitants suffer from early-onset Alzheimer's disease, which is caused by the gene mutation E280A. The genetic mutation is thought to have come from a Spanish conquistador. Approximately 5,000 residents will develop early-onset Alzheimer's. Half of the affected residents were shown to have developed symptoms by their early 40s. ^ Lalli, Matthew A.; Cox, Hannah C.; Arcila, Mary L.; Cadavid, Liliana; Moreno, Sonia; Garcia, Gloria; Madrigal, Lucia; Reiman, Eric M.; Arcos-Burgos, Mauricio (2014-10-01). "Origin of the PSEN1 E280A mutation causing early-onset Alzheimer's disease". Alzheimer's & Dementia. 10 (5 Suppl): S277–S283.e10. doi:10.1016/j.jalz.2013.09.005. ISSN 1552-5279. PMC 4019728. PMID 24239249. ^ Reitz, Christiane (2015-03-01). "Genetic diagnosis and prognosis of Alzheimer's disease: challenges and opportunities". Expert Review of Molecular Diagnostics. 15 (3): 339–348. doi:10.1586/14737159.2015.1002469. ISSN 1744-8352. PMC 4677675. PMID 25634383. 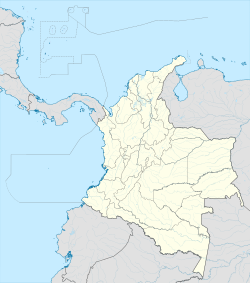 This Department of Antioquia location article is a stub. You can help Wikipedia by expanding it. This page was last edited on 2 May 2018, at 09:45 (UTC).